The Hampton lakes are two small lakes called Upper and Lower Hampton Lakes that during high water become one lake. One can kayak both lakes by portaging over the narrow strip of land that separates the lakes. Its is possible to paddle into the other lake without portaging during high water levels. Both lakes are located in the Columbia National Wildlife Refuge, south of the Potholes Reservoir. Sometimes the gate to this lake is close requiring one to walk about a mile to the lake. Lake is normally open from April - Sept. 30th unless otherwise posted. Fishing: Rainbow & Cutthroat Trout. More info at fws.gov/columbia. 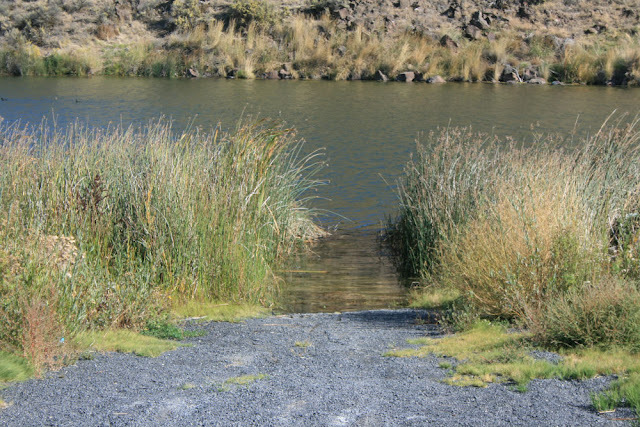 Directions From Moses Lake take HWY 17 south toward Othello; turn right (west) on HWY 262/O'Sullivan Dam Road. Approximately 2 miles up the road on your left (south) you will see the entrance to Sheep Lake Rd. 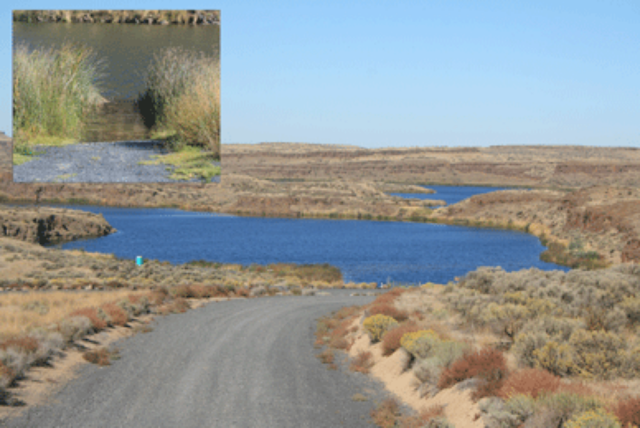 Follow this road all the way to past the Long & Sage Lake sign, proceed across the Potholes Canal via the bridge. The road makes a sharp turn right and where the road make a sharp turn left there is a sign indicating Hampton Lakes. Proceed down this road until you come to the Lower Hampton Lake launch and trails parking lot. Maps: To view a map click on google.com/maps and type in Hampton Lake, Spokane County, WA. The map will say Hampton Lake and show the larger of the two lakes. To see the boat launch move down the map a little where the smaller lake is (Lower Hampton Lake, not labeled on the map). Info: Open April 1 - Sept. 30. ACCESSIBILITY: PARKING... Large gravel parking lot; PATHS/TRAILS... None; RESTROOMS/FACILITIES/SHADE… Fully accessible restroom. No designated picnic areas or shaded area. No trees; DOCKS/LAUNCHES/PLATFORMS… One narrow gravel primitive boat launch best suited for small lightweight watercraft; DIRECT WATER ACCESS… No access for wheeled mobility devices. Access water via narrow launch when no powerboats are present, assistance likely needed. Watch out for mud; TRANSFER SYSTEMS... None; SENSORY... No sensory tactile markers for those with visual and other impairments; CAMPING... No; O.T.H.E.R… Oddities/Barriers: Lots of sand and mud during wet times of the year along shoreline; Terrain: Level to about 3% grades; H2O/Water: Water normally murky. Water temperature in the summer can be around 60 to 70 degree. Drinking water not available; Environmental Conditions: High winds and hot summer temperatures; Resources: Food, drinks, and gas in town of Othello (Wal-Mart) and at Potholes Reservoir resort area.